I came home for Thanksgiving on Wednesday to spend time with my family. We're really close and always have a good time with each other so I've been looking forward to the holiday for a while now. One of my favorite parts of the holidays is getting to spend time with my three year old niece, Shelby. She's so sweet and it's been amazing to watch her change from a little blob to a real person who talks and has opinions. On Thursday, Shelby found a cookbook that my mom used with my sister and me when we were growing up. It's from Gold Medal Flour and, even though I haven't seen it in a while, when she showed it to me it brought back a lot of memories. It's called Alpha-Bakery and has a different recipe for each letter of the alphabet. Shelby flipped through the pages and stopped at Z, Zebra Stripe Cookies. She asked if we could make them and I told her that, because it was still Thanksgiving Day and she had another meal to eat, we would try to make them on Saturday. Saturday came and it was decided that after my mom, Dominique, and I finished shopping we would pick Shelby up for baking and a sleepover. We picked her up, got back to the house, and set about getting all of our ingredients out. 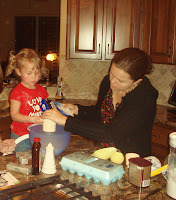 Have you tried baking with a three year old? It's tough. Keeping her focused was an issue but Dominique and I managed to let her help as much as possible while still getting the cookie dough together. The recipe was easy enough, but the instructions for making the stripes weren't very good. After a couple of tries, Dominique managed to figure it out and we were in business. Here's the recipe with what I'm pretty sure was the method Dominique devised for the striped dough. Mix flour, sugars, vanilla, margarine, salt, and egg until dough forms. Divide dough in half, mix cocoa into one half. Pat or roll each half into a nine-inch square. Cut the cocoa dough into thin strips and lay on top of the plain dough, make sure to press the strips firmly into the dough so they bake in to each other. Wrap in plastic wrap and refrigerate until chilled, 1 to 2 hours. Heat the oven to 375. We didn't much feel like cutting zebras out of the dough, so we used cookie cutters to make shapes out of our striped dough. Shelby was in charge of picking which cookie cutter we used, so there's an assortment. Christmas angel, Texas, gingerbread man; it's a mixed bag. Put the cut out cookies on a cookie sheet and bake for 8-10 minutes. When we ran out of space on the dough for cookie cutters, we just smushed the left over dough together and made marbled cookies. That looks so cool. I'm toatly going to try this!